Annotation: What would you do with 2.5 million dollars? When a customer leaves Indigo Skye a 2.5 million tip her whole life changes, but for the better or the worse? Plot Summary: Indigo Skye is content with her life. She has “a waitress job she loves, an adorable refrigerator-delivery-guy boyfriend, and a home life that’s slightly crazed but rich in love”. When a customer leaves her a 2.5 million dollar tip, things start to change. All types of people from family, friends and strangers are giving her advice on how to spend that money. Indigo gets warnings that money will change her and she brushes it off thinking that she will be the same – just with more money. Does money change a person? Can Indigo remain true to who she is? Critical Evaluation: Caletti explores the rag to riches story in this charming light-hearted novel told through first person point of view. While the plot is a little far fetched, Caletti does a fantastic job exploring philosophical discussions of money and values throughout the storyline. The message that money can potentially corrupt is a bit heavy-handed, the story is saved by the quirky charming characters and the splashes of humor. Indigo herself is full of sharp details and fun wit like her descriptions of her quirky pets and family like her mom who’s denying her menopause to her younger sibling Bex who loves CNN, and Chico, their not-so-nice bird. One can feel the love she has for them and it is nice to see YA stories where the home life isn’t full of doom and gloom. The story itself was not a fast-paced romance or drama. 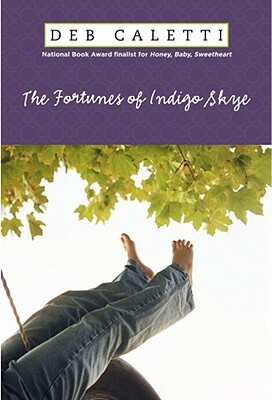 Rather The Fortunes of Indigo Skye is a quiet, whimiscal piece that reminds me of Sarah Dessen’s work. A story not about money leading to happiness but rather a girl who is figuring out what she wants from life and rather be poor and rich in love than rich and despondent. For fans of Sarah Dessen, Jennifer E. Smith or fans of light realistic fiction. Challenge Issues: Given this light read, there is nothing really controversial in the story to challenge. However, if the novel does get challenge, I would point to the star review from Publisher’s Weekly, the positive portrayal of family, and a character with a great sense of self and values even if she gets derail sometimes.